Go to the Utilities subfolder. In the left pane, click the triangle to expand the section that says "User Diagnostic Reports". 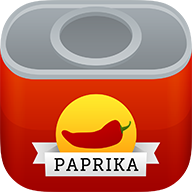 Look for any reports that begin with "Paprika Recipe Manager". Save the file somewhere on your computer (e.g. your Desktop). Repeat this for all crash logs that begin with "Paprika Recipe Manager". In the left pane, scroll down and select "system.log". Click on File -> Save a Copy As... and save this file to your computer too. Upload both the Paprika crash log and the system log to your support ticket.